I've created 3 levels for my new Interval Bamboo obstacle. I actually had to make each level twice . After making all of the levels the first time, I decided I should give the player more time to chop each interval bamboo, which required me to re-design all the levels. I said before I wanted to make it a bit easier to distinguish the different pitches, and I did that by making each interval bamboo emit a 2 note interval rather than 1 note. It's much easier to identify an interval than it is to recognize a stray pitch. I also messed around with the sound a bit since the last post, because the previous rhodes sound was too close to the electric piano sound of the regular bamboo. I needed something that was "plucky" (something that doesn't ease in, but instead starts at nearly full volume) so the player can determine the pitch as fast as possible. I made something better but that sounds weird to me at higher pitches, so it'll still need some tweaking. I recorded a video for it this time, because you can't really understand what's going on with a gif. Please excuse the unedited jank. Level 6-1: Interval bamboo on one side with regular bamboo on the other. Basically, interval bamboo on it's own felt kind of empty, so the regular bamboo keeps your hands busy. Level 6-2: Interval bamboo interspersed with itself and wood. Gets you to process two intervals at the same time. Also makes a cool beat with the wood. Level 6-3: Interval bamboo interspersed with memory bamboo, regular bamboo, wood, and rocks. The memory bamboo and interval bamboo both require a lot of attention, so it's a bit tricky. I've been working on animating the background some more. I started with the clouds. The cloud 3D model was the only thing from the asset store I had in my game. I planned on making my own to replace it, because you can't animate prefabs other than their transform. Then I found out that animating just the cloud's scale gave a cool effect, and made the cloud do a little wiggle. But after fully implementing that, I realized the right tail of the cloud looked kind of weird during the animation. Looks like a angry snake or somethin. I was gonna have to make my own cloud. So I made a cloud in blender, and used the same scale animation trick to animate the new cloud. It got me something that's pretty good, but might be a bit too subtle. My plan is to make them animate faster as levels speed up though, so maybe it's fine if they start out subtle and then get crazy further into the level. I also animated the sun. I tried some stuff with armatures to give the sun a sort of "hot and bubbly" look, but nothing I tried looked very good. I ended up deciding some more subtle scale animations would again do the trick. The sun is in the center of the screen, where the player will be focused, so I don't want the sun moving around too much anyways. I'm sure I'll further tweak things once I program the background to speed up over time. The more I see of this game the cooler it looks! Love the music as well. Tyty. Hopefully once I find the right sound for all of my instruments I can start making some real bangers. So, I made some levels for my interval bamboo. Again . I previously gave the player 3 waves to chop through one interval bamboo obstacle. I figured it would make more sense to allow players to chop a random obstacle in the middle (on the 2nd wave), to make things more interesting. Cool idea, but it meant I had to redo all of the interval bamboo levels again. I also updated level 6-1, 6-2, 7-4, and 9-3. Actually after fixing 7-4, I realized it was already hard enough without interval bamboo, so I probably won't even keep it in there . To be fair it shouldn't have taken that long, I just wrote all of those levels with spaghetti code that was hard to parse back through. The interval bamboo isn't polished, but it works. I'm mostly just glad it's in a steady enough state that I can start working on something else for a bit tbqh. Haven't posted in awhile because of college exams and my graphics card dying, but I've got a good chunk of stuff to share. Most of what I've worked on revolves around the "control flip bamboo". This obstacle shows up on one side of the screen, but you have to chop through it as if it showed up on the other side. Basically you have to mentally switch your left and right hand controls. It's the last obstacle in the game, it's supposed to be annoying. I had the logic for this programmed ages ago, but I only just came up with the model for it. I came up with a rectangular outline thing that worked well. It had the shape of bamboo, but was less dominant so you felt less of an urge to chop it directly or something. I ended up making control flip versions of my regular bamboo, memory bamboo, and rhythm bamboo obstacles. So far I've made 6 different levels to house them, and plan to make at least 2 more. Level 12-1: All regular control flip. I made them follow a pattern where the orientations get mirrored between waves. This makes it easier to get your hands to do the right thing, so your eyes know what it looks like when things are executed properly. Level 12-2: Regular control and regular bamboo on the same side. Level 12-3: Regular control, regular bamboo, rhythm control, rhythm bamboo. Follows this pattern: 2 waves have control flip obstacles on both sides, then 2 waves have control on one side, non-control obstacle on the other, repeat. Level 12-4: Regular control, regular bamboo, rhythm control, rhythm bamboo, and memory bamboo. Objects no longer follow any pattern. This level is mostly to teach you how to chop the control flip obstacles when you have to dedicate some of your attention to something else (the memory bamboo). Level 12-5: Memory control flip and regular bamboo. Follows a basic pattern so you have a chance to figure out how the memory control flip works. With my current plans, I only have 5 more levels left to make! I just took the final for one of my summer classes, and my other class is a joke, so my next two weeks are completely open. To make the most of it, I've come up with a schedule that will allow me to work on Katto as much as possible without getting stressed out. Game dev cocoon mode. 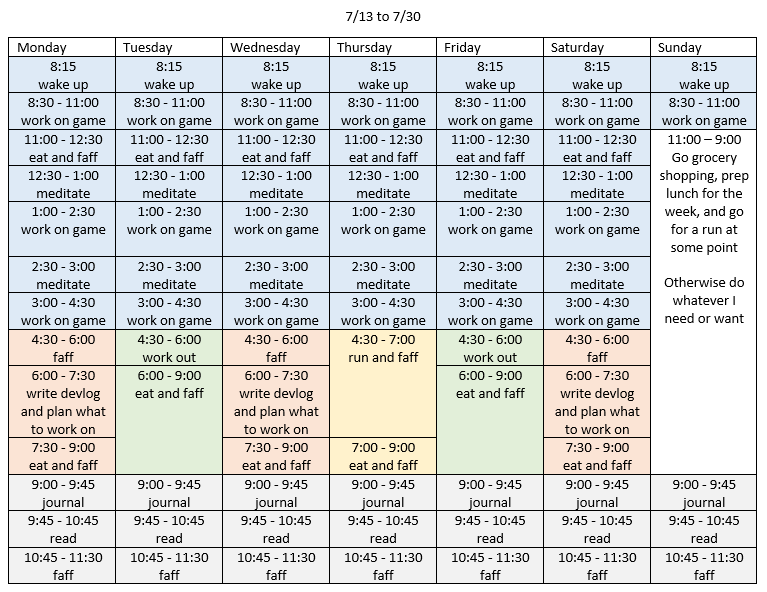 The big changes from my regular schedule are the 2 extra sessions of working on the game, and the 2 meditation sessions. I'm not too experienced with meditation, but it's the best thing I've come across for clearing mental fatigue. Watching Youtube or Twitch can calm my brain at a similar rate, but meditation doesn't ever distract me for longer than I plan it to, and I'm more likely to have motivation after meditating. It's nothing too crazy, but this is the most strict schedule I've ever made for myself. See you on the other side. I've created a new obstacle variant, and 4 new levels. I created a control flip version of the bamboo stack. I ended up just taking a normal stack and making the last piece of bamboo into the control flip version. Any more and the stack would take too long to chop. Level 12-7: Control flip and regular bamboo. For me, this level was really hard to play at first, but got much easier with time. Level 12-8: All control bamboo variants, and all stack bamboo variants. This is currently the hardest level in the game. Sadly part of that is because it's hard to sight read the difference between a control stack, and a regular stack with a control obstacle in front of it. That probably sounds like gibberish unless your a #1 Katto fan. I'll worry about it l8r. Level 10-1: Rhythm bamboo and interval bamboo. Having rhythm bamboo by itself was slightly lame, so I added interval bamboo. That gave me a chance to put both of the music based obstacles together. Level 10-2: Rhythm bamboo with dynamite, wood, stacks, and nail obstacles on the other side. You have to keep a steady tempo with the constant rhythm bamboo, while chopping through obstacles with uneven rhythms on the other side. As far as that schedule I posted last time, it's working well so far (2 days in lol). The hardest part is actually the meditation, I'm not so good at controlling my attention yet. Even still, I'm slightly more focused after meditation, so I work a little faster. One thing I discovered about a week ago that's still proving to be true: most of the mental fatigue I get from working for a long time is just from dehydration. So there's your tip for the day, drink more water. I've created what should be the final obstacle, and logic for the final 2 levels in the game. You hit it at least once with any button, and then mash all of your buttons to chop it as many times as you can. Each extra chop gives you extra points. This obstacle was made to replace the "Long Bamboo" obstacle I created about a year ago, which basically had the same logic. The problem was long bamboo took up both sides of the screen, which was needlessly limiting, and the chopping wasn't very satisfying. It's annoying because it's the obstacle I put the most work into modelling and animating, but I couldn't justify keeping it when I knew how to improve it. The decimate obstacle still has a temporary texture, and I need to make custom katana animations to go along with it, but I did make those sweet animations of the wood slowly getting chopped up over time. Level 11-1: All obstacles except control flip and dynamite. Decimate shows up for every 16th beat. Gives you a chance to experience all of the obstacles without control flip and dynamite, which tend to be the most challenging. So that's the first draft of all the obstacles and levels complete! I'll of course make some changes as I test the game more, and every obstacle is gonna need at least some texture work, among other touch ups. I'm gonna neglect that for a bit though, I'm excited to start workin on some new stuff. I've been working to get steam cloud saves to work, and fixing a bunch of tiny problems along the way. I was originally using Unity's PlayerPrefs to score highscore data, but that writes to registry files I can't access. I needed to save game data to a regular file so it could be uploaded and downloaded with the steam cloud. The FileBasedPrefs outputs a single encrypted .txt file with all of the save data on it. Most games seem to use .sav files for save data, but I can't figure out what makes that any better than .txt. Maybe it's the implication that .txt files are meant to be editable by users? It's probably taking me longer to write these sentences then it would to change the output file's extension from .txt to .sav. While setting that up, I started messing with Steamworks.NET. It provides a C# wrapper for the steamworks SDK (which is written in C++). I also started tracking how many obstacles a player has chopped (separated by obstacle type), and refactored some code. I'm gonna start planning these roadmaps a bit more now. I've been burned too many times from implementing something specific that doesn't work when I make a more general change . As my tasks become smaller this becomes less important, but better late than never! I got steam leaderboards working! First I made a spot in the level select UI for a leaderboard. I was originally gonna put the highscore, max speed, and leaderboard for a level in that UI panel on the right, but it created a lot of unnecessary white space. Also, The leaderboards are the most important thing on the screen, so it made sense for it to take up the whole panel on it's own. That left panel is eventually going to have spinning 3D models of the obstacles that show up in the selected level. The leaderboards store your score and the amount of obstacles it took to get that score. I ripped that idea straight from Spelunky - seeing someone that died at an earlier level than you but got a higher score shows how much you could improve by playing better. This'll make sense once I program obstacles to give you more points for chopping them closer to the beat. Ignore the highscore in the top right. I reset my highscores every time I launch. I've added a combo system and brought my game to a semi-stable state. The combo system keeps track of how many obstacles you hit with perfect timing in a row. You can still chop an obstacle a bit before or after the beat, but it'll give you a tenth of the points. I'll probably change it a bit so combos instead give you extra points on top of what you get for chopping an obstacle, but the desired effect is already there. Now on top of hitting obstacles correctly, there's a meta game you can play of trying to increase your combo. I thought it might be hard to get the "perfect timing" window to be precise, but the easy approach I gambled on seems to have worked out. I used Unity's AudioSettings.dspTime to compare the time an obstacle was chopped with the time of the current music track being played. I'm not sure if it's a psychological thing, input lag, or both, but I kept finding myself hitting the buttons slightly before the actual beat of the music. To combat this, I just made the perfect timing window start 0.055 seconds before the beat, and end 0.035 seconds afterwards. Maybe that sounds janky, but here's how I rationalized it: when you're playing piano, you begin pressing a note down slightly before it should be played because it takes time for the note to be pushed down . All that matters is that it feels right, and for that I'm about 90% of the way there. To get my game in the semi-stable state I just had to fix a bunch of small bugs that mostly aren't worth mentioning. I did implement those leaderboard buttons I was talking about in the last post, but I'm the only person on the leaderboards, so idk if they work heh. Hopefully I can get some people to test the game now. With finals coming up and plans to visit family, my game dev cocoon mode is officially over. Thought I'd give a quick summary of how it went. For game dev, the schedule was a success! I skipped one day to go hiking, but other than that I only missed 2 of the 45 remaining game dev sessions. It's the stuff other than game dev that I was lazy about, because I didn't find them as important I guess. I worked at a pretty good pace during my morning work session, but there was about a 50% chance of me being slower during the "afternoon slump" sessions. The meditation break was supposed to help with that, and it was better than my old strategy of working for 3 hours straight in the afternoon, but the problem was still there. In the future it might be better to take 20 minute breaks every hour instead of 30 minute breaks every hour and a half. I've realized the point of taking more breaks isn't to rest your brain more, but to break up your work more. That way you need to have a small goal for each work session, so your less likely to lollygag. I can't go full pomodoro technique though. Only being able to work for 25 minutes makes me angry, and 5 minutes barely feels like a break. I didn't expect too much from the meditation, it was really just a distraction-less break from working. I got slightly better at holding my attention on my breath, but that's about it. Could be because I already knew about the concept of mindfulness, so I'd already gotten all the nooby gains. Good for calming your brain and bones tho. The bigest takeaway is that this schedule improved my relationship with work. I think I like it. I thought this schedule might make me go crazy, but I'm more content then I've been in ages (I might go crazy without it tbh). There is one thing that makes this schedule different from previous ones I've tried: I got to choose all of it. I didn't have to dedicate certain hours to school or a job - which are sprinkled with personal goals, but ultimately someone else is telling you what to do. Instead I knew that at any given time, I was doing exactly what I determined was most important for reaching my goals. With spending more time during the day in flow, and seeing real progress towards my goals, I felt a lot less anxious than usual (and I'm a pretty anxious guy). This gives me hope that I could work well with freelance or entrepreneurial stuff, which might be more fun than a software development job idk. Anyways ya. I work well with a schedule, maybe u do 2. I've added a daily challenge mode! After making 12-9, my final level, I had a function that would randomly generate a level with all of the obstacles in the game. This does most of the heavy lifting for the daily challenge logic, but there were a few changes I had to make. To make sure everyone got the same challenge, I used Steamworks' SteamUtils.GetServerRealTime() to generate a unique daily seed, and fed those seeds into C#'s Random class. Also, level 12-9 spawns every object in the game, but I wanted the daily challenges to spawn objects from a smaller randomly selected pool. I made it more likely for daily challenges to have a small pool (2 to 6 objects) than a larger pool, because obstacle combinations are more interesting that way. Like, if you have 15 different obstacles, adding a 16th doesn't make things that much different. It's hard to know if it's working 100%, because I can't test every seed. There are certain obstacle combinations that would break the game, so it'll take a bit more testing before I'm really confident. I've made some updates to the UI, and added an exciting new "life" system! For the UI, I added some spinning obstacle models to the level select screen. This shows what obstacles a level will contain. I've been planning to do this for awhile, but wasn't sure what approach to take. My original idea was to spawn a separate camera for each obstacle I wanted to have spinning, and then I could project each camera onto a RenderTexture that I then put on top of the UI. Turns out having that many cameras would have been horrible for performance, so I only use one extra camera to capture all of the spinning objects. Also, chroma keying a RenderTexture wasn't easy to figure out, so instead I make the background transparent by using camera culling. Now the life system: you no longer get a game over for the first mistake you make. Currently you have to mess up 3 times to lose, which seems fair. Then for every obstacle you chop correctly, you get a little life back. This makes the game more fun. Keeps you in the action longer, and allows you to lose focus for a second (which tends to happen after awhile) and still have the chance to get back on track. I talk about a few game design problems I've overcome. I'm still not content, but I do feel like my videos are steadily improving over time. This was the first video I've fully story boarded, and that worked out pretty well. Separating the step where I decide what footage I want from the step of collecting footage made both go by much faster. I've been working on background music. I decided that each of the 12 obstacles would get it's own music. Mostly because there was no other music schema that made sense to me. One song for all levels? Boring. A small pool of songs to randomly select from each time you play a level? Could work but kind of lame. I already have a problem where all of my levels feel similar because they have the same environment in the background. Giving each level set their own song would help differentiate them a little, and could also be something to look forward to when you encounter a new obstacle. I've already come up with 12 rough drafts for each song. I basically sat at a piano for a couple days punching out random rhythms to see what stuck. The stipulation was each song had to use the same FMajor7 CMajor7 chord progression. 1: because I knew it worked with the pentatonic scale the melody uses, and 2: I still wanted each song to have something in common so they felt like they were part of the same game. Each song is broken up into 8 sections, ranging from 60 bpm to 200 bpm. Every 32 beats, when the level in the game speeds up, the track with the next highest bpm is played until you reach the max speed for that level. One problem I've already come across was making the music too complex. It can't compete with the melody that the player will be creating in-game. This is mostly a good problem to have, just don't put as much effort into the songs lul. The challenge is to make the songs simpler, without making them too similar. A little update on the music. I've got 8/12 of the songs done. I had 9.5/12 done, but I canned one midway through, and got rid of another one entirely. They were both bad because they had too much of a melody, and didn't line up enough with the beat. These tracks are supposed to be background music, and then the player dynamically creates the melody over top of it. Since it was hard to come up with 12 unique tracks that use the same chord progression, I ended up adding some more melodic stuff to certain tracks to give them more variety. I thought I could get away with it if the melodies were simple and repetitive. It wasn't disastrous or anything, but it did clash a little with the players melody at times. I decided it would be better to have some tracks sound similar but be 100% functional, rather than tracks that sound different but are 80% functional. I was able to salvage one song that had a complex melody and heavily simplify it, but not the other 1.5 songs I mentioned before. Also, in the songs I got rid of, their melodies didn't fully match up with the beat. They were still in 4/4 time, but they were using weird 32nd notes and slightly missing the on-beat for style. Turns out that's a bad idea for a rhythm game. The player can create melodies that don't fully line up with the beat, so if the background music also doesn't fully line up with the beat, it's not gonna sound so good. Just a few more songs to go. an easy idea with a great goal! Thank you! It was supposed to be an easy idea at least - maybe how long it's taking to implement proves that wrong lol. The music is FINALLY COMPLETE! Let's analyze what happened. Look at all those little files. I made those. I made 12 songs. I planned for it to take 2 weeks. It took me 4 weeks. I guess I never stopped to consider how long it would take to make each song. On my most productive days, I was able to make about 1 and a half songs. This was when the entire day was dedicated to making music though, which was rare because of school. It really looked more like this: make 1/4th of a song one day, do 1 and 1/4th the next day, and then take a 1-2 day break to study for an exam or catch up on homework. Combine this with the two songs I worked on and ended up throwing away, and whaddya know, that's about 4 weeks for 12 songs. To be honest, motivating myself to work on this music has been more challenging than motivating myself to work on anything else in the game. I'm still not sure entirely why though. Surely the biggest thing was constantly failing to meet the milestones I set for myself, because I really underestimated how long things would take. Also, all of my songs had to sound pretty similar to fit an overall theme (they all used the same chords), which could get a little stale. Coming up with the main motif for each song was a fun little challenge though. The big positive was that it made me more confident with music composition. I played piano for 4 years in high school, but always found writing my own music a bit daunting. Maybe I'll finally learn jazz piano after I'm done with this game. For now, I'm excited to get back to work on the actual game. I sort of ghosted the internet this past month, because I didn't want to share all of my music and spoil it, but I plan to be a bit more active again. So, hey whats up. I've made changes to the Interval Bamboo obstacle (again). 1) Initially hitting the obstacle by pressing any katana button felt kind of awkward. The main mechanic of the game is to hit obstacles with the correct orientation, so dropping it felt out of place to me. 2) Deciphering between the three music intervals was pretty hard, even after I practiced with it for about a month. I thought this might be a problem from the beginning, but was hoping the skill would be easier to train than it ended up being. My solution was to separate the first and second stage of the obstacle. For the first stage, I created a little music note model that can be in any orientation. Problem 1 solved. You hit it just like regular bamboo, but once hit it plays one of two intervals (a whole step of an octave) and bounces back to the main Interval obstacle. Having two intervals to distinguish between instead of three is a huge difference. Problem 2 solved. Now I only chop it incorrectly if I lose focus, which is the way things should be. Also, I changed the obstacle's accent color. The pink music notes looked too similar to two of my other pink obstacles, and melted into the background trees a bit, so I had to switch it to black. Black music notes make sense anyways.